It’s hard to believe that it was 37 years ago on August 01, 1981 that MTV Music Television first lifted off to launch a video oriented music channel and the careers of countless artists who became superstars in an era of priceless focused media attention. 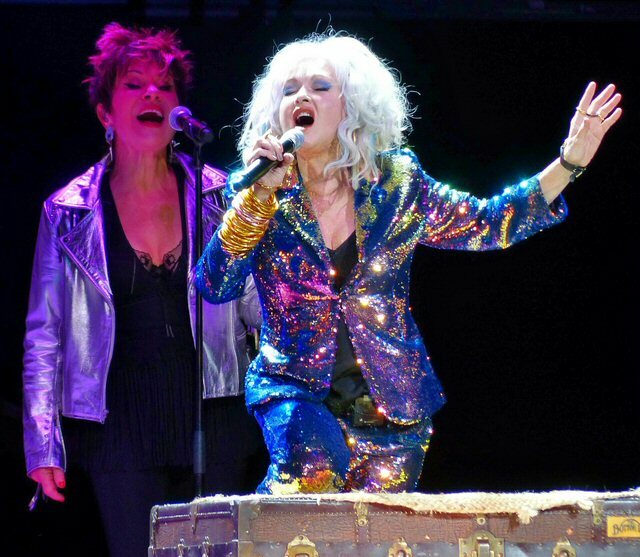 Two acts who benefited from ubiquitous airplay in the network’s early years – Rod Stewart and Cyndi Lauper – brought their electrifying roadshow to Nashville’s Bridgestone Arena in 2018. Even though it was MTV’s birthday neither act mentioned that fact directly but the presence and influence of the 80’s broadcast innovation was still felt decades on all through the night. 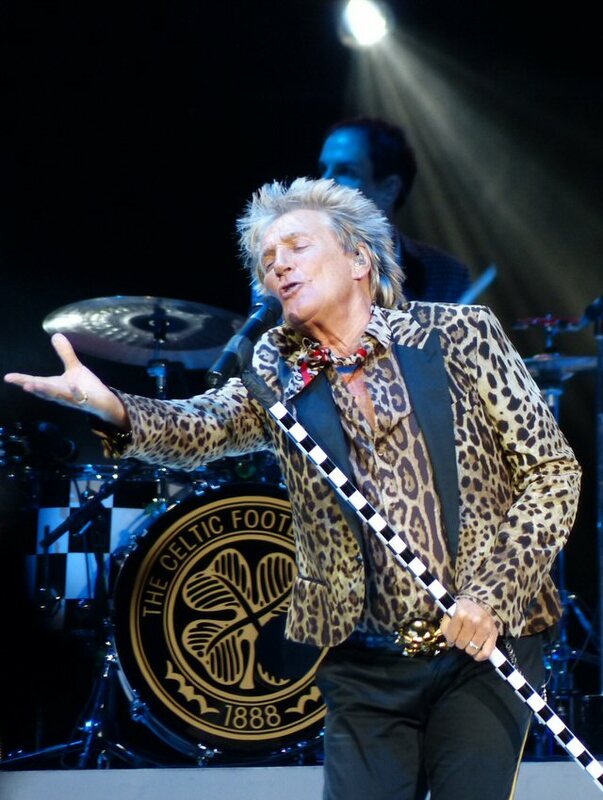 Rod Stewart remains a captivating performer. Consider Rod Stewart. He was already a rock god by the time the new music network rolled out. He found success with his group The Faces that included future Rolling Stone Ronnie Wood in its ranks. Their “Stay With Me” charted high in 1971 and the rockin’ track was slotted close to the end of Stewart’s nearly two-hour set in Nashville. Later in the decade Rod’s golden touch was heard on “Tonight’s the Night (Gonna Be Alright)”, “Maggie May” and his riveting version of “The First Cut Is the Deepest” by Cat Stevens. All three were properly showcased in Music City. But, it was his hit songs from the 80’s when the ability to actually see and hear the artist from the comfort of a living room that seared Rod’s image into the minds and hearts of his loyal fanbase who over the years were responsible for his impressive 100 million plus record sales. Rod’s headlining spot drew heavily upon this fruitful decade with numbers such as “Infatuation”, “Young Turks”, “Forever Young”, “Rhythm of My Heart”, “Downtown Train” and “Have I Told You Lately” all adding up to make this hot summer night a completely pleasing career retrospective. Stewart had a large and multi-talented band who shined especially when paying homage to Rod’s geographical roots. The lovely ladies in the group were doing double duty as back-up singers, dancers and fiddle players all coming together nicely on the love song “You’re in My Heart (The Final Acclaim)”. Now, you might think this track was for a woman or perhaps a family member but you’d be wrong. We learned in Nashville that Rod actually wrote it for his football team as he is a Celtic United fanatic. Video clips of the team in action amplified the already fervent feeling for the squad. 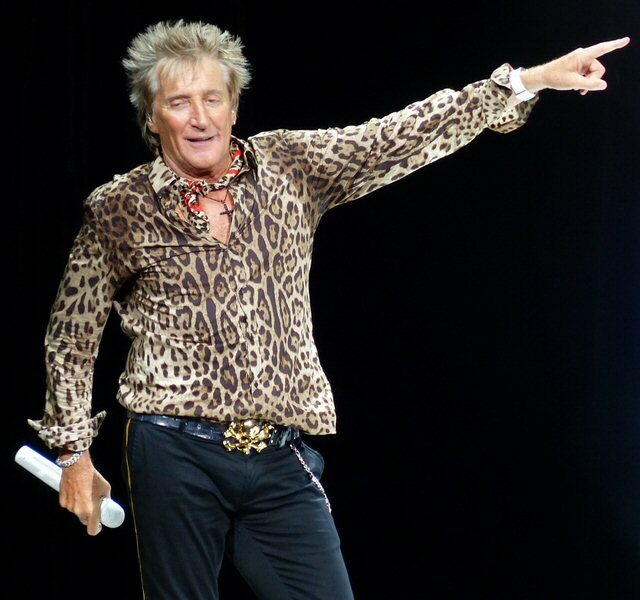 Rod Stewart made it a point to include a lot of hits during his time onstage in Nashville. Rod’s roots were in the house as the concert was a Stewart family affair. He was joined by his daughter and Nashville’s own Ruby Stewart who together with Alyssa Bonagura make up The Sisterhood and together the two added a dose of youthful adrenaline on “Forever Young”. Near the end of the show Aiden Patrick Stewart helped his father kick some well fought over soccer balls into the ecstatic audience. Rod’s youngest son also did his part to bring back break-dancing. Rod’s reputation as a womanizer precedes him and the fact that he has a seven-year old while himself in his seventies proves that he has been busy in more ways than one. His children present on this night were the offspring of Stewart and his model wives Kelly Emberg and Penny Lancaster-Stewart. Mid-way through the show when Rod coyly and ever so slightly lifted his shirt to expose his mid-riff region the legacy fans in the crowd lost control. Rod definitely likes the ladies. And, the ladies still love Rod. Cyndi Lauper’s colorful, feisty and quirky personality were a perfect match for MTV and she was one of the first household names to breakout through the medium. She said from the stage during her opening spot at the Bridgestone that she was able to feature her mom in many of her videos that were popular on the channel back in the day. She recalled aligning herself with many pro wrestlers like Captain Lou Albano. When she played “The Goonies ‘R’ Good Enough” its video aired on the big screen and it was fun to try and pick out the all the actors she gave credit to. Cyndi Lauper was expressive and energetic in Music City. One thing that Lauper’s well-honed caricature of herself might have blurred over the year’s is her work as an advocate for positive social change. She introduced her “Shine” from the mid-2000’s as an Internet hit that became an anthem for LBGT awareness. When she was joined onstage by The Sisterhood for “Girls Just Wanna Have Fun” it became an empowering statement of womanhood enhanced by video clips with scenes of protest that played on the name of the song. For the pair – this concert was not a reprisal of their glory days but more a revisiting of their recent past and 2017’s triumphant double bill. For this year’s trek they will pick up where they left off with a 22-date tour that began in June at the Hollywood Bowl in Los Angeles, CA with a Lauper homecoming scheduled for the prestigious Madison Square Garden in New York on August 7th. 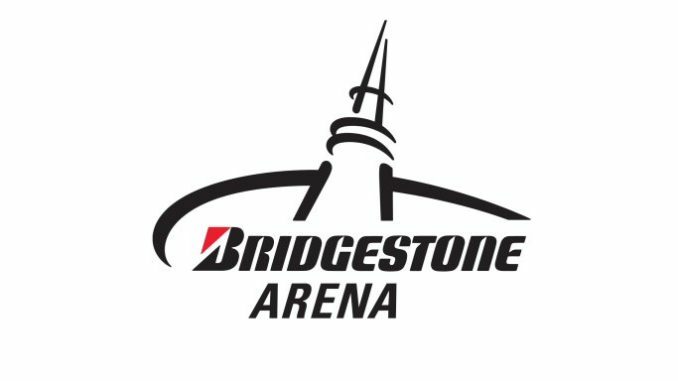 It’s no wonder that the Bridgestone Arena remains among the top of it’s class in large stadium venues. There’s not a bad bucket-style seat in the house and fans can stroll around four entertaining concourse levels prior to the show complete with restaurants, Gill and Ben the Catfish, a Brad Paisley hand-painted mural and large wall size photos of great past nights in the building. Upcoming anticipated events are the PBB, Keith Urban, Def Leppard and Journey, Maroon 5 along with the 2018/2019 campaign of the always competitive Nashville Predators. 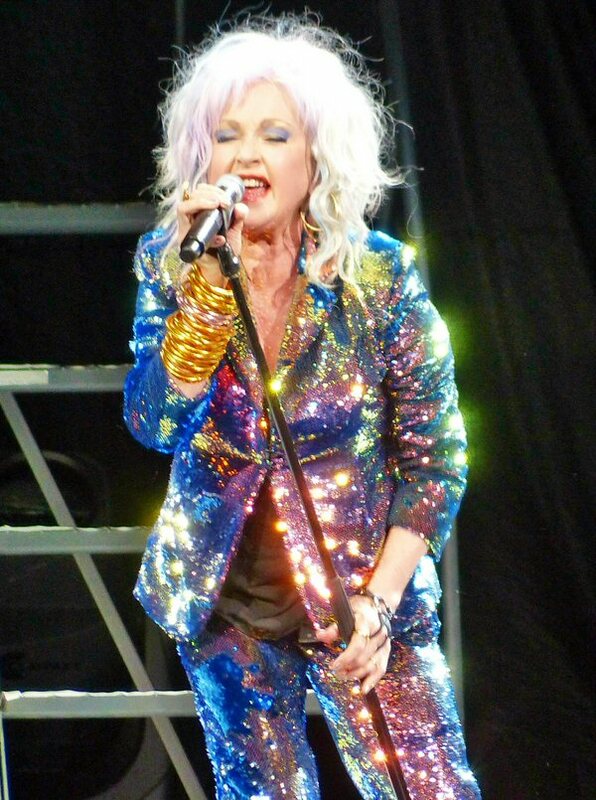 Cyndi Lauper dazzled in a sparkly rainbow-colored pantsuit.